You have read different accounts about the squadron’s first kill. Well since it was my plane here is the way it was. We were covering a northbound convoy of about fifty ships. When we got off the coast of Belem we were relieved by another squadron. So we went into Belem for gas and spent the night. The pilot was lt. Ford and the copilot was ltjg Dawkins. We met at the plane the next morning and mr. Ford ask us if we wanted to fly back over the jungles or the ocean. No one knew so he said he would flip a coin. the results were that we would go the ocean route. We took off and headed south. The crew was tired from all of the hours we had spent in the air the days before so we told them to sleep and get some rest. Meanwhile I was alone in the after station seated next to the port fifty caliber. We were flying about three thousand feet out at sea. I had a pair of binoculars and was seeing if I could make out where the water and sky met. There were quiet a few clouds but I could see patches of blue water ever so often. In one of the openings I spotted a white wake and a u boat off the port side. I called lt.Ford and told him there was a sub about eleven o'clock. He told me that he hadn’t spotted it yet. I had already unstrapped the port gun when we made a sharp left bank and put ole 83 p 2 in a steep dive. He had spotted it and was going in for the kill. I begin to strafe the sub and tracers were flying under the port wing. We could see the crew on deck most in bathing trunks. They tried to pull covers off their deck guns but never made it. Lt. Ford straddled it with two depth charges on each side. 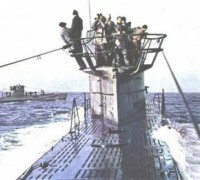 I continued firing as the bombs exploded and the sub rose and broke in half. We made a sharp turn to the port and I kept on firing. All of a sudden a hand on my shoulder pulled me back and said bill you are killing all the survivors. Mr. Ford went down to about a hundred feet and began to circle. One guy was straddled on a tank of some sort and another was swimming toward hi. There were a few bodies in the water and lots of oil and debris. Water began to get rough. We made a pass and I threw a life raft over the side. The currents carried it away from them so we went upwind and threw our last raft out. It inflated and both men got aboard. I took a canister of water. Wrapped a life vest around it and threw it to them. It got rough and we lost sight of the raft. We radioed their position and headed for Fortaleza. We landed with about eighty gallons of gas. I had shot the antenna off under the port wing and we had to fix it. Lt. Ford made reservations in town and we all checked in. We were all seated at a large table eating a victory dinner. About the end of the meal I looked up and never saw so much brass. I hollered attention and we all stood up. At ease and please be seated. It was Admiral Ingram and his staff that got the word and flew all the way to Fortaleza. First thing he said was. which one of you is Goodell and Ford after shaking hands with everyone they left. We took off real early the next morning for Natal. The men were still in their tents. Lt. Ford said lets wake them up. He called the tower and got permission to make a victory run. He came down to fifty feet poured on the coal and went over the tents wiggling his wings. Boy what a thrill. Guys ran out in skivvies wondering what in the world was going on. We found out later the two survivors were picked up and were in Fortaleza. We sent a plane up and brought them back to Natal. You have a photo of them boarding the PBY. 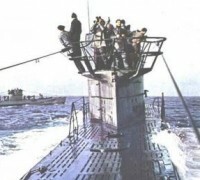 We found out from them that we had sunk u-164. Contributed by GOODELL, Billie N.